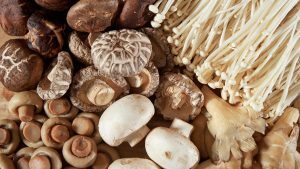 A unique antioxidant in mushrooms has a protective effect on the brain, new study finds. A new study found people who ate mushrooms at least twice a week were half as likely to develop mild cognitive impairment. Mild cognitive impairment is the stage between the expected cognitive decline of normal aging and the more serious decline of dementia. It can cause problems with memory, language, attention and locating objects. For the study, researchers from the National University of Singapore followed the diets of over 600 senior citizens for 6 years. Participants were asked how often they ate six different types of mushrooms: oyster, shiitake, white button, dried, golden and tinned. The more mushrooms they ate, the better the higher scores they got on brain tests involving thinking and processing. The results were particularly impressive in those who ate more than two servings (or 10 ounces) a week. Tea, green leafy vegetables, nuts and fish are also beneficial for the brain, she noted. The nutrient most likely responsible for the dramatic results is the anti-inflammatory antioxidant ergothioneine, the researchers say. Mushrooms are one of the richest sources of ergothioneine. “There are lots of factors that contribute to the development of dementia and it’s estimated that up to a third of cases could be prevented by changes in lifestyle, including diet,” Dr, James Pickett, head of research at Alzheimer’s Society, told the BBC.